Nebraska is the fastest team in college football history. Husker head coach Scott Frost watched his old school, Central Florida, open its season last Thursday and pile up 56 points against a Division III school wearing create-a-jerseys from NCAA '14 while only having the ball for 16 minutes. He was not impressed. Just you wait and see. When Frost first got home, he set the table for what was to come. We should have been prepared for Saturday’s one-minute game. Welcome to Frostian football; blink and you might miss it. Blink and you’ll be left standing in the rain. Nebraska eats its watermelon fast. It doesn’t have walk-throughs, it has sprint-throughs with speed that would rival Usain Bolt after his 17th can of Red Bull. Nebraska always hits the “skip intro” button on Netflix. It is a pro-Talladega Nights school with a Ricky Bobby cutout in the weight room to remind players if you ain’t first, you’re last. So, yes, the games are fast. All you saw on Saturday was a kickoff because after years of pro-style offenses that’s all your eyes have been conditioned to see. There was a full game played in those 60 seconds. True freshman quarterback Adrian Martinez had his lumps, as some would often expect a true freshman quarterback to have in his first game, but ultimately put on a show. His final line: 24-for 31 passing, 276 yards through the air, another 183 yards on the ground on 11 carries, four total touchdowns and one interception. Nebraska’s offense was slow to get rolling out of the gates (I know, unacceptable) but eventually found its footing. Halftime saw a 27-0 lead for the Huskers as Akron became the on-field equivalent of the blurry Mr. Krabs meme. They turned it over twice to begin the second half (Frost said there would be mistakes) but Akron never capitalized. On the team’s eighth and final touchdown, Frost went for two. They converted; 57 points. Eat it, Josh Heupel. A good day meant the team was allowed to walk off the field rather than run. For every point scored on Saturday, each player is granted one second of slow time to recover. Sources close to the team say no one was really sure why fans and media hung around in the cold rain for three hours after the victory. Disorientation, maybe? Students stayed dancing in the rain atop metal bleachers for a while after as lightning cracked around Memorial Stadium, proving to their parents at home they never actually go to that 9 a.m. science class. With each new flash, gathered media acted as if it was the first time they’d seen lightning in their lives. Husker players were already well into their third match of Fortnite and Frost had already finished next week’s game plan. Speed reigns supreme. Opponents better get prepared for it lest they meet a fate similar to Akron. 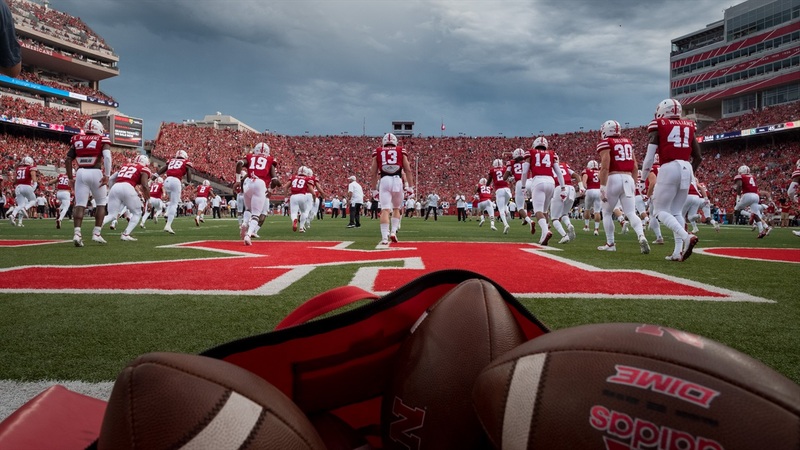 Fans better get acclimated to it unless they want their Saturdays to be highlighted by players briskly jogging out of a tunnel and onto the field. This is Nebraska football now. Don’t blink.